owned by the late Mrs Sheilah Garnett and bred by Fran Brain. 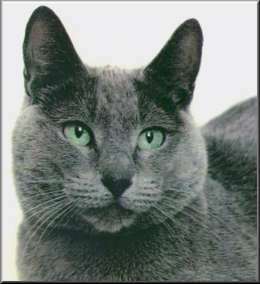 Welcome to the official web site of the Russian Blue Breeders' Association. The RBBA is affiliated to both the "Governing Council of the Cat Fancy", the organisation which oversees similar clubs and associations in Great Britain, and International Cat Care (formerly the Feline Advisory Bureau), a charity which promotes the health and welfare of cats. Some additional testing for cats imported into the GCCF registry have been incorporated into the Russian Registration Policy following the recommendations made in the recently published Russian Cats Genetic DIversity Project. This Registration Policy was approved by the GCCF in February 2018. A copy of the policy can be found here, on the news panel and by using the button at the bottom of the page. If you are interested in buying a kitten (in the UK) the information you need is in the Breeder's list & Kitten Notes. Of course, kittens aren't always available. We don't have any information about American breeders, but there are a number of sites in links section which should be able to help you. Note the Welfare link. The RBBA, through its Welfare Officer, organises a rehoming service for homeless Russian Blues. You may feel that instead of a kitten you would like to adopt an older cat. If this is the case this page will tell you how to go about it. I'm afraid this service is restricted to the UK due to quarantine regulations.